Step 1 Preheat the oven to 200C/400F degrees. Grease a pie/quiche dish. Step 2 n a bowl, whisk the almond flour, coconut flour and salt. Add the butter and mix until thoroughly combined. I use my hands to make breadcrumbs, then into a large ball. Gently place the pastry into the baking tin and press it out over all the edges as even as you can. Bake for 15-20 minutes until slightly golden. Remove from the oven and reduce the temperature to 180C/350F degrees. Heat a frying pan on a medium heat and add the butter. Cook the salmon fillets for about 8-10 minutes until cooked throughout. Turn over during cooking. Remove the salmon from the heat, and with a fork or spatula, break the cooked salmon into flakes. Step 3 In a bowl, beat the eggs with cream and the dill. Season with the salt & pepper. Place the broccoli florets into the pastry case. Spoon the salmon into the pastry case. Pour the egg mixture over the filling and bake for 35-40 minutes until golden and firm. 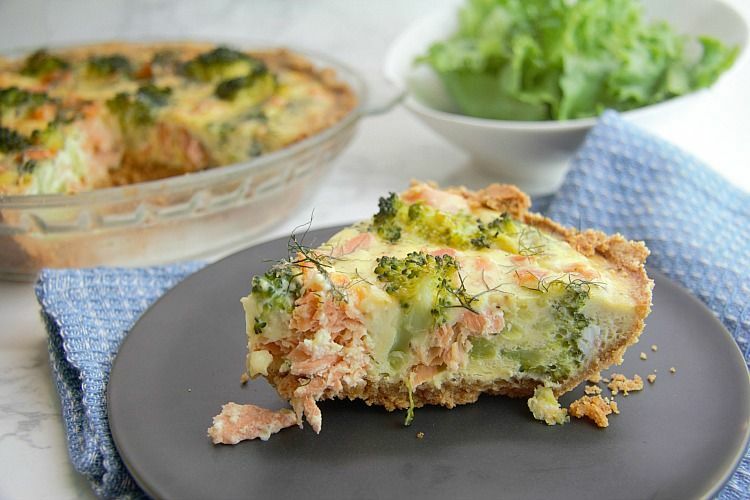 A rich low carb pastry case that makes a light salmon quiche with added broccoli and dill makes for a delicious lunch. Enjoy a slice warm from the oven or cold for lunch. Perhaps for breakfast too!